Steve Grand OBE was responsible for the architecture and programming of the artificial life engine in Creatures, and the ideas present in this have had an effect on all games in the Creatures series. He regards his job as being a 'Digital god', which is perhaps not unreasonable considering some of his achievements; he defined much of the in-game mythology (though he admits he 'stole most of [it] from the early English and Scandinavians'), as well as coming up with Norns, Grendels, Ettins and the Shee (originally 'Siðe'). 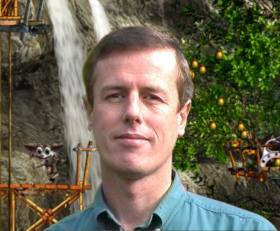 Steve began working on Creatures - originally envisaged as a DOS game - in late 1992. In 1994 Millennium set up a subsiduary, Cyberlife, to develop his ideas, and he became Director of Technology soon after the release of the game. Steve organized and spoke at the Digital Biota 2 conference in Cambridge in 1998. Steve became leader of the Cyberlife Institute R&D lab upon its founding in late 1998. The Institute closed when he left Cyberlife at the end of 1999, although he gained permission to use the name for his new company, Cyberlife Research. See history and interviews for more information. Steve was married to Ann Grand, who also worked for Cyberlife Research. They have one son, Christopher. Steve resides in Flagstaff, Arizona and has worked on creating an intelligent living machine called Lucy in a custom-built mechanical body shaped like an orangutan. He managed to get £65,000 towards this goal from NESTA - a fortunate benefactor, as he didn't personally make a huge amount of money from the success of Creatures, being 'just an employee' (although he did have some share options in Cyberlife). He released Simbiosis open source under the release name Simergy on SourceForge. He was also involved in the NESTA Create-a-Creature project, and is a wiki user. Steve has released several demos of a new artificial life game called Grandroids. Creation: Life and how to make it, dealing mostly with the development of Creatures and the philosophy behind it. Sample chapters are available on Steve's blog. He also wrote several highly interesting articles on the development of Creatures before and during his time at Millennium/Cyberlife, as well as the unfinished novella Wulf's Journey. GreenReaper: If you want to find out more about the history of Creatures, you should read all of these, right now. I create artificial life. I apply my scientific skill to the detailed and complex simulation of neurons, biochemicals and genes, and then assemble them delicately and with care into living, breathing virtual creatures. I nurture these tiny defenseless souls into existence, place their miniature, pulsating brains into their cute little heads. And then I kill them. If Creatures was going to have any influence at all over people's lives, the one thing I really wished for was that it might prompt questions in their minds about life and what it means. And it did this in bucketloads. Take cruelty, for example. One Creatures fan (who I believe is in the US Navy) started a Website entirely devoted to ways in which people could be cruel to these creatures. He devised various tortures to make their little lives a misery, and I think he did so with his tongue firmly in his cheek and a challenging grin on his face. I was so pleased about this (although I didn't dare say so publicly while I still represented the company that made Creatures, for fear that it would upset our customers), because it forced people to think about whether this really was cruel. I expected him to elicit some response from the other Creatures owners, but not quite such a hostile one as ensued. The poor guy recieved an enormous amount of hate mail, and was excluded from the Creatures Internet community for a long time. Much of his hate mail showed a greater regard for the creatures than it did for the life of this one human being. Less traumatically, I was pleased to see people start up Websites of their own in response, setting them up as rehab centers and adoption agencies to provide shelter for the poor victims of this virtual abuse. This was not the behaviour of people who felt that life had been debased by the existence of artificial beings, nor was it the behaviour of people who were scared of artificial intelligence. These people were going out of their way to protect and care for these creatures, and they held them in equal regard to other more natural forms of life. They may have been overreacting, but I was glad of the sentiment. Creatures ALLOWS people to enact all sorts of horrors on their synthetic friends, but it doesn't condone or encourage it. If someone chooses to do something disgusting to a norn and at the same time is willing to believe that that norn is in some sense alive, then that person is probably sick. I was demonstrating Creatures to my mum, and she'd begun to build up an attachment between two little souls when all of a sudden my PC crashed. When I explained that little Ron and Eve were gone, never to be seen again, mum cried. Best sign I've ever had that the program was on the right track! Interestingly, Steve Grand has an account on the Creatures Wiki as Digitalgod. Steve Grand is a frequent contributor to the science website, Machines Like Us. This page was last modified on 3 July 2017, at 05:09.